An Internet Sales Consultant finds and closes sales through electronic mediums; these consultants foster strong customer relationship online and earn commissions based on the number of sales earned. 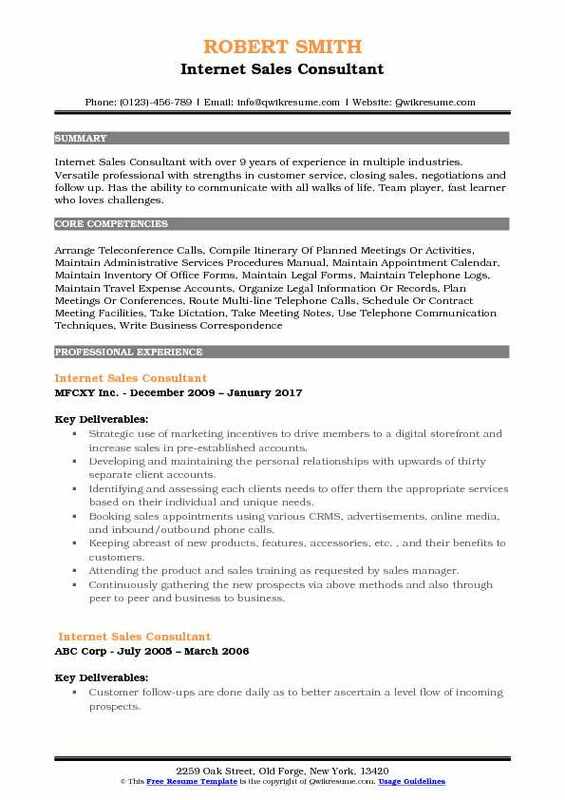 The various job tasks typically listed in successful resume include – answering inbound sales calls, responding to internet leads, scheduling appointments, leading customers through phones and emails, meeting and greeting customers, initiating sales process and negotiating figures to close sales. 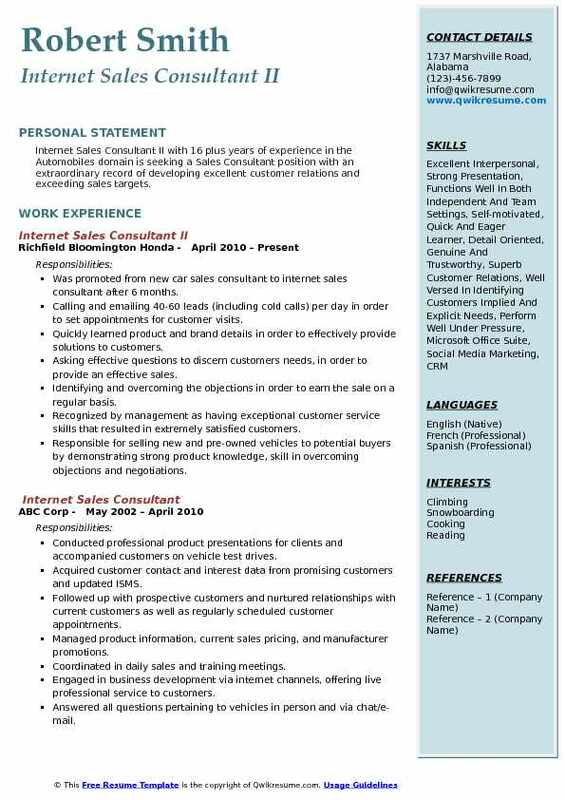 Successful characteristics expected on the Internet Sales Consultant Resume are inbound and outbound calling skills, excellent verbal and written communication skills, MS Word and MS Excel proficiency, the ability to organize and multitask; negotiation skills and a thorough knowledge of CRM software. While a high school diploma is considered sufficient for this post, many employers require an associate’s degree or Bachelor’s degree in marketing or sales or advertising. 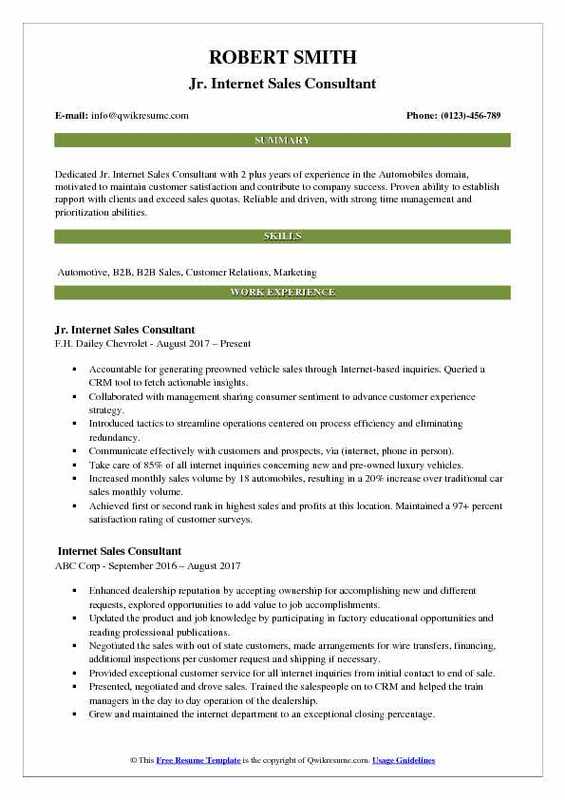 Objective : Junior Internet Sales Consultant with 3 plus years of experience in the Automobiles domain is seeking to find a job that effectively allows me to use all of my allocated skills collectively and to the highest of my degree to better the company that I am working with and for. Organized, and having the ability to monitor all sales leads and maintaining the detailed customer files. Managing the customer leads using CRM tool, responding to all inquiries in a quick and timely manner. Answering the customer questions on product inventory, helping people find the best car for their needs, and explaining the benefits of the vehicles. Driving the internet traffic into the dealership, making appointments for interested customers, and continuously following up throughout the buying process. Understanding the needs of a diverse client base and is able to adapt them approach accordingly. Setting and meeting the sales goals, helping the dealership to remain profitable. 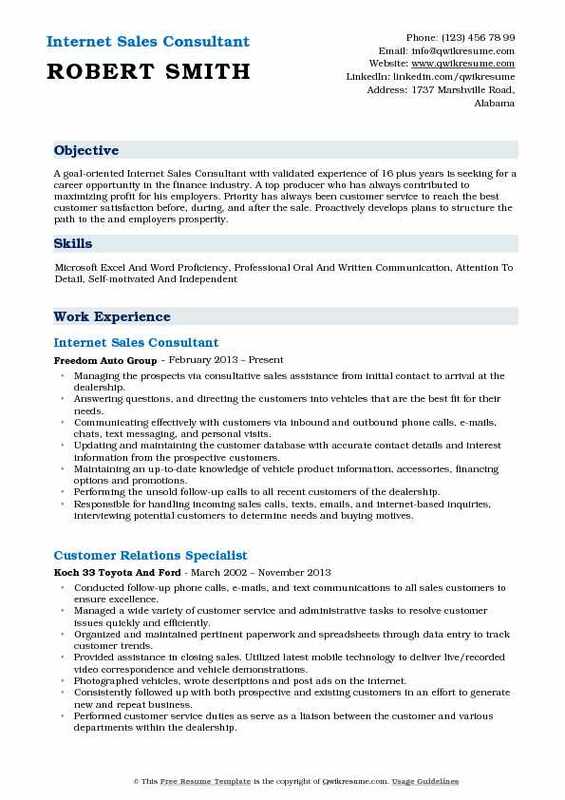 Respond to all sales internet leads and set up sales department appointment accordingly. Bring all customer concerns and complaints to the attention of the sales manager. Discuss during customer follow up calls the importance of responding to CSI surveys. Summary : Senior Internet Sales Consultant with 7 years of experience in the Automobiles domain is seeking a Financial Services Sales position with a company that focuses on excellent customer service, as well as ethical, engaging, quality, consultative advising and sales. 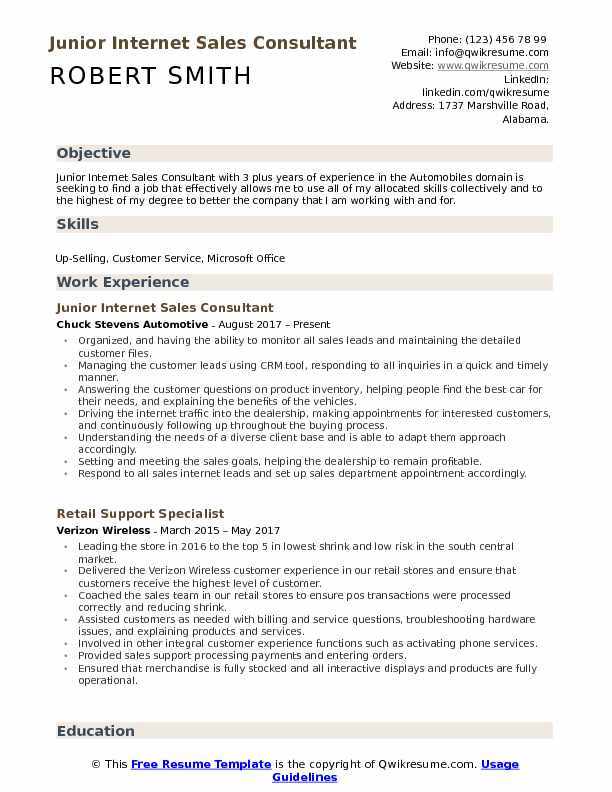 Skills : Office Equipment, Cash Handling, Supervisor, Computer Hardware, Customer Service, Customer Relations, Communications, Problem Resolution, Budgeting, Recruiting, Inventory Management, Invoicing, Financial Analysis, Filing, Phones, Forecasting, Typing, Team Building, Sales, Reporting, Data Entry. Keeping the dealership's website up-to-date with vehicle specifications and availability. Selling a minimum number of vehicles or bringing in a minimum of customers from the internet, based on goals and objectives defined by the sales manager. Disclosing terms of sales with consumers and reviewing sales with dealership management. Preparing sold vehicles for customer delivery prior to customer arrival. Also carrying out promotional and sales activities for the organization on the internet. Providing relevant information online for the prospective clients. Making the follow-up phone calls to previous day sales customers to ensure complete satisfaction. Following up and reschedule missed or late service and sales department appointments. Answering all incoming chat request and corresponding to customers in a timely manner regarding their vehicle interest. 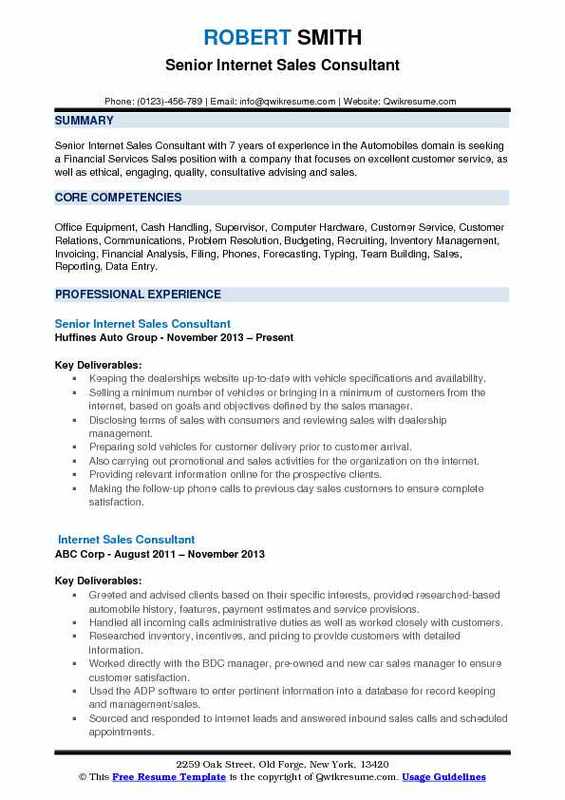 Objective : Dedicated Jr. Internet Sales Consultant with 2 plus years of experience in the Automobiles domain, motivated to maintain customer satisfaction and contribute to company success. Proven ability to establish rapport with clients and exceed sales quotas. Reliable and driven, with strong time management and prioritization abilities. Accountable for generating preowned vehicle sales through Internet-based inquiries. Queried a CRM tool to fetch actionable insights. Collaborated with management sharing consumer sentiment to advance customer experience strategy. Introduced tactics to streamline operations centered on process efficiency and eliminating redundancy. Communicate effectively with customers and prospects, via (internet, phone in person). Take care of 85% of all internet inquiries concerning new and pre-owned luxury vehicles. Increased monthly sales volume by 18 automobiles, resulting in a 20% increase over traditional car sales monthly volume. Achieved first or second rank in highest sales and profits at this location. Maintained a 97+ percent satisfaction rating of customer surveys. 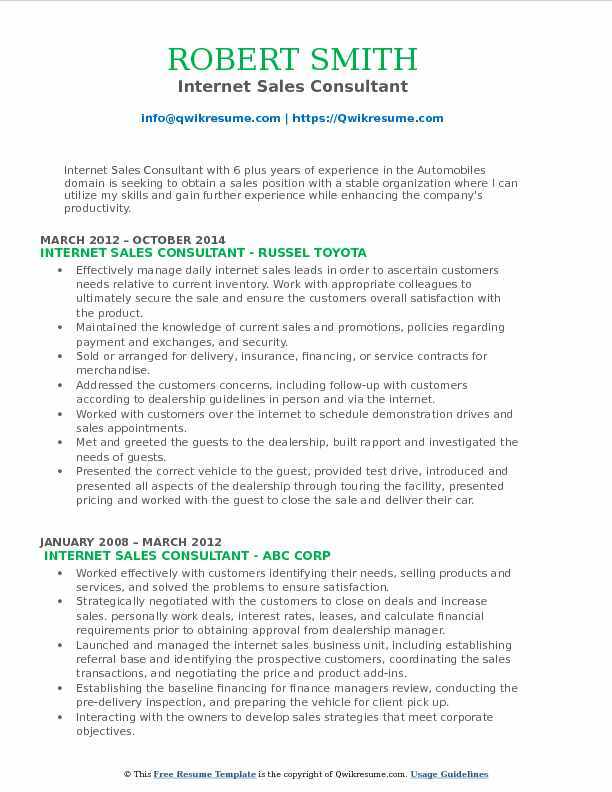 Summary : Energetic, positive, driven Sr. Internet Sales Consultant with 8 plus years of experience in the Automobiles Domain is desiring to become part of a great team where I can continue to grow with the company, utilizing skills I possess while developing new strengths. Ensuring that exceptional customer service is provided on a daily basis while assisting customers with information about our current or upcoming inventory and line of vehicles. Establishing a strategic sales plan while implementing initiatives that promote sales and building long-lasting relationships with our customers. Directing all incoming calls and emails to the appropriate location and department. Assisting the customers with information about vehicles of interest while promoting the sale of the vehicle. Scheduling the VIP appointments for customers to come test drive or receive a free appraisal on their current vehicle. Answering the email information requests from potential customers about features and availability of the vehicle. Making outgoing calls to current or potential customers with information regarding our promotional services and incentives. Providing all requested information to the customer including credit reporting status, financial requirements, and warranty information. Summary : Internet Sales Consultant II with 16 plus years of experience in the Automobiles domain is seeking a Sales Consultant position with an extraordinary record of developing excellent customer relations and exceeding sales targets. 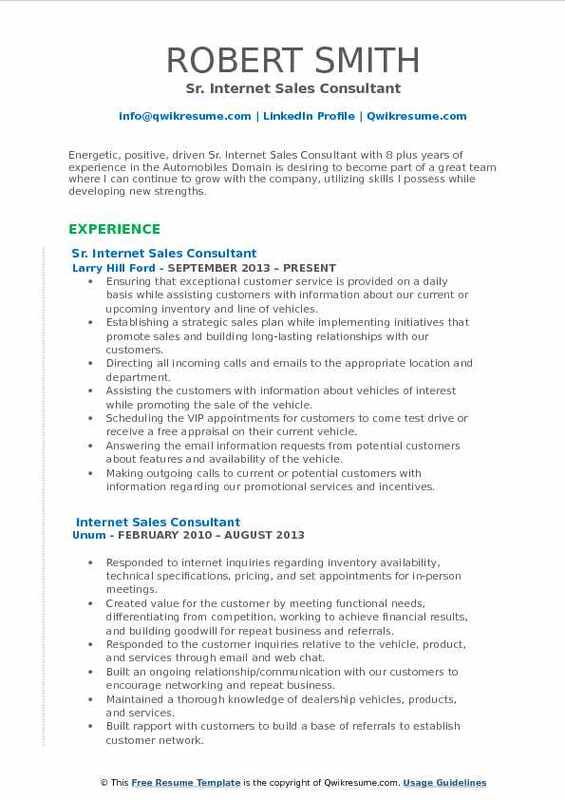 Was promoted from new car sales consultant to internet sales consultant after 6 months. Calling and emailing 40-60 leads (including cold calls) per day in order to set appointments for customer visits. Quickly learned product and brand details in order to effectively provide solutions to customers. Asking effective questions to discern customers needs, in order to provide an effective sales. Identifying and overcoming the objections in order to earn the sale on a regular basis. Recognized by management as having exceptional customer service skills that resulted in extremely satisfied customers. Responsible for selling new and pre-owned vehicles to potential buyers by demonstrating strong product knowledge, skill in overcoming objections and negotiations. Handlin g60-80 incoming phone and internet sales lead monthly. Responsible for taking the customer from their original contact through delivery of their vehicle. Daily follow ups and prospecting. Maintained a strong knowledge base of all new vehicle makes and models. Maintaining the complete customer satisfaction throughout the sales process and through the delivery of the vehicle. Summary : A goal-oriented Internet Sales Consultant with validated experience of 16 plus years is seeking for a career opportunity in the finance industry. A top producer who has always contributed to maximizing profit for his employers. Priority has always been customer service to reach the best customer satisfaction before, during, and after the sale. Proactively develops plans to structure the path to the and employers prosperity. Managing the prospects via consultative sales assistance from initial contact to arrival at the dealership. Answering questions, and directing the customers into vehicles that are the best fit for their needs. Communicating effectively with customers via inbound and outbound phone calls, e-mails, chats, text messaging, and personal visits. Updating and maintaining the customer database with accurate contact details and interest information from the prospective customers. Maintaining an up-to-date knowledge of vehicle product information, accessories, financing options and promotions. Performing the unsold follow-up calls to all recent customers of the dealership. Responsible for handling incoming sales calls, texts, emails, and internet-based inquiries, interviewing potential customers to determine needs and buying motives. Educating the customers on our products and services, calculating vehicle pricing and payments and providing solutions to buying challenges. Scheduling customer appointments for in-store presentations and test drives. Summary : Internet Sales Consultant with 6 plus years of experience in the Automobiles domain is seeking to obtain a sales position with a stable organization where I can utilize my skills and gain further experience while enhancing the company's productivity. Effectively manage daily internet sales leads in order to ascertain customers needs relative to current inventory. Work with appropriate colleagues to ultimately secure the sale and ensure the customers' overall satisfaction with the product. Maintained the knowledge of current sales and promotions, policies regarding payment and exchanges, and security. Addressed the customers concerns, including follow-up with customers according to dealership guidelines in person and via the internet. Worked with customers over the internet to schedule demonstration drives and sales appointments. Met and greeted the guests to the dealership, built rapport and investigated the needs of guests. Presented the correct vehicle to the guest, provided test drive, introduced and presented all aspects of the dealership through touring the facility, presented pricing and worked with the guest to close the sale and deliver their car. 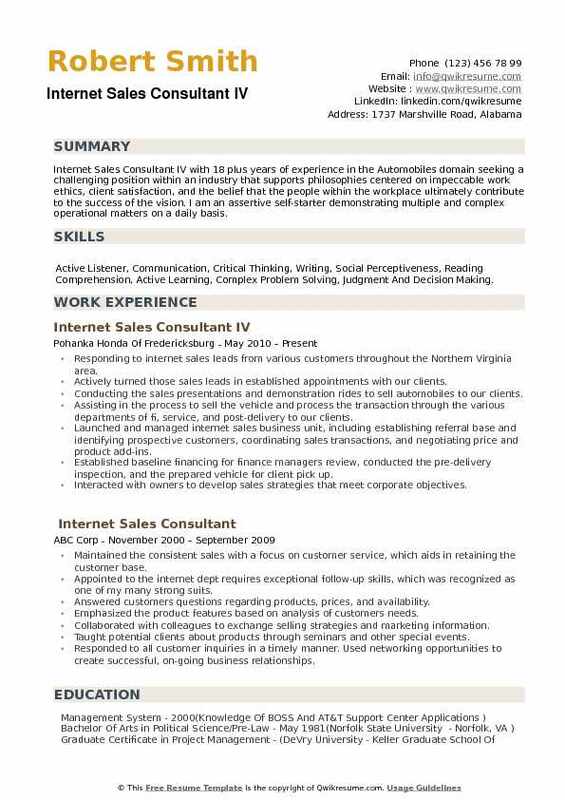 Summary : Internet Sales Consultant with over 9 years of experience in multiple industries. Versatile professional with strengths in customer service, closing sales, negotiations and follow up. Has the ability to communicate with all walks of life. Team player, fast learner who loves challenges. Strategic use of marketing incentives to drive members to a digital storefront and increase sales in pre-established accounts. Developing and maintaining the personal relationships with upwards of thirty separate client accounts. Identifying and assessing each clients needs to offer them the appropriate services based on their individual and unique needs. Booking sales appointments using various CRMS, advertisements, online media, and inbound/outbound phone calls. Keeping abreast of new products, features, accessories, etc. , and their benefits to customers. Attending the product and sales training as requested by sales manager. Continuously gathering the new prospects via above methods and also through peer to peer and business to business. Working with walk-in traffic on an overflow basis. Logging all contacts made and provided data to upper management. 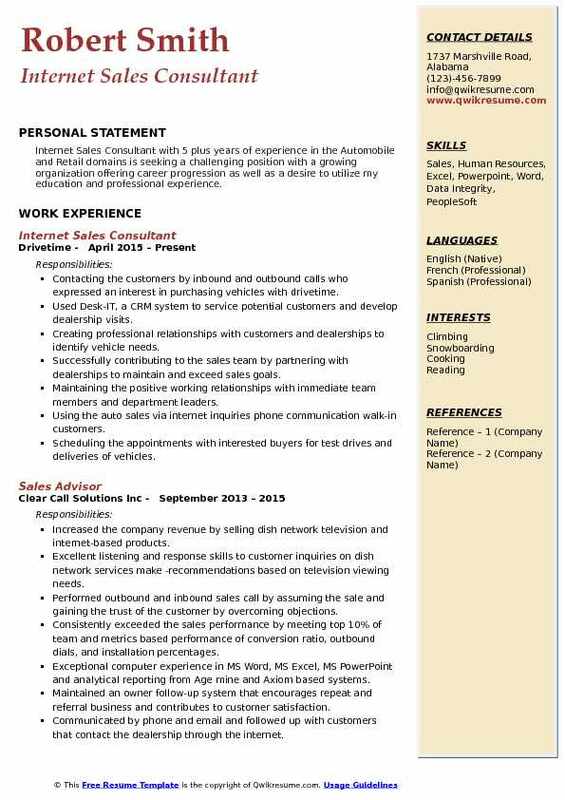 Headline : Internet Sales Consultant with 5 plus years of experience in the Automobile and Retail domains is seeking a challenging position with a growing organization offering career progression as well as a desire to utilize my education and professional experience. Contacting the customers by inbound and outbound calls who expressed an interest in purchasing vehicles with drivetime. Used Desk-IT, a CRM system to service potential customers and develop dealership visits. Creating professional relationships with customers and dealerships to identify vehicle needs. Successfully contributing to the sales team by partnering with dealerships to maintain and exceed sales goals. Maintaining the positive working relationships with immediate team members and department leaders. Using the auto sales via internet inquiries phone communication walk-in customers. Scheduling the appointments with interested buyers for test drives and deliveries of vehicles. Stayed informed with business marketing efforts, and services provided by handy Toyota. Managing the internet sales leads, responding to the inquiries in a timely fashion, answering the questions on available stock and producing the performance. Establishing personal goals that are consistent with dealership standards of productivity, and devising a strategy to meet those goals. Summary : Internet Sales Consultant IV with 18 plus years of experience in the Automobiles domain seeking a challenging position within an industry that supports philosophies centered on impeccable work ethics, client satisfaction, and the belief that the people within the workplace ultimately contribute to the success of the vision. I am an assertive self-starter demonstrating multiple and complex operational matters on a daily basis. Skills : Active Listener, Communication, Critical Thinking, Writing, Social Perceptiveness, Reading Comprehension, Active Learning, Complex Problem Solving, Judgment And Decision Making. Responding to internet sales leads from various customers throughout the Northern Virginia area. Actively turned those sales leads in established appointments with our clients. Conducting the sales presentations and demonstration rides to sell automobiles to our clients. Assisting in the process to sell the vehicle and process the transaction through the various departments of fi, service, and post-delivery to our clients. Launched and managed internet sales business unit, including establishing referral base and identifying prospective customers, coordinating sales transactions, and negotiating price and product add-ins. Established baseline financing for finance managers review, conducted the pre-delivery inspection, and the prepared vehicle for client pick up. Interacted with owners to develop sales strategies that meet corporate objectives. Responded to phone calls and internet inquiries, set up appointments, sold and delivered their car.